HHHHHello my dear friends! I hope all of you are having a delightful Christmas. A lot of you are having indeed a white xmas! How wonderful for the kids (the big kids..yeah I mean YOU! LOL)…..
ello Crafters! I hope you are all doing well and enjoying this gorgeous fall we are having! For our friends down south…time for a warm up! Enjoy! Well it is time for a little update about out very first Gilli Design Team call. We have received many beautiful projects. We are blown away by the creativity and lovely details! The deadline for submission was supposed to be tomorrow. Yeap, I said “was”. We will be extending the deadline submission for a few days. Some of you might know already that my very best friend in this whole world and partner had a very serious and life threatening medical emergency this past week (We thank you all for your thoughts and prayers, they are so comforting. THANK YOU!). I cannot even try to explain how important Rami is to me….and Gilli. Rami spent a few days in the hospital and now has been recovering at home…and he needs to stay away from work for a few more days….since Rami is an essential gear to me and Gilli…We decided to extend the Design team call. We will wait for Rami and in the the mean time something sad should become a good opportunity for all of you! Other Countries: November 16, 2010 ( the extra time was allotted for international mail delivery). We are looking for YOU! Don’t shy away! You are a very talented and creative person! Send in your favorite project we would love to see it. If you were “still think’, now is your chance! Life is good and beautiful…..Let’s all make the best of this second chance!!! YOU CAN DO IT! For this tag I used Bildmalarna stamp, StampingScrapping Design stamps; Nestability beaded ovals, Nestability large ovals. The StampingScrapping Design stamps fit perfectly inside of nestabilities…see you have a delightfully shaped tag with beautiful matching background and sentiment! Please join us at the Bildmalarna challenge where anything goes! Hey you cannot go wrong in this one! No one will complain in getting a little early gift from Santa, right? Bildmalarna stamp :: Christmas Tree Tossa; StampingScrapping Design Stamps beaded ovals & celebrate, Copic marker w5, w3, YG67,G25, G03, B91, B41, B97, YR21, YR02, BG10, E11, E01, E000; Stickles frosty lace and star dust;White Flock; Ribbon and Floss; Neenah paper; Memento inks. Dare to join me at Gilli Blog to learn and see more about the project….? a tight huggie for ya….hahAHHAHHHA. ello crafters! Here it is! Our call for the very first Gilli Design Team! Do you want to have fun with other Gilli gals and guys? So read up! We will be waiting to hear from ya!!! We are looking for five individuals from anywhere on planet earth, to participate for one full year in the new and very first Gilli / StampingScrapping design team. Even if you are new to the paper craft world, you may still qualify. In addition to being creative and skilled, our designers should be enthusiastic, creative and team spirited. We love designers who think outside the box and we admire cool new ideas. If in addition to being creative, you interact well with others, you work well with deadlines, you are a good communicator, and you are very respectful of other team members and team leaders, we want you as part of our team. If you want to have loads of fun, have a lot of exposure, enjoy the many benefits and great learning opportunities, please come join us! Hello people! Having fun in the sun? Well fall is in full force around here and I cannot wait to stroll around and see what nature has painted. To celebrate this beautiful fall season I prepared this little Magnolia card all in vibrant colors! For this card I used Magnolia stamps, stamped with memento ink on Cryogen paper and colored with copic marker (E00, E01, E11, Y02, y11, y15, yr21, E08, E19, E97, E37 and w1) and added a litta glitah! LOL Yes, I added a lot of sparkle to this gal so she would be perfect for Magnolia Stamp lovers current challenge. Also I made her top a bit sheer so my card could be added also to the current challenge that I am hosting at at The Copic Challenge Group (from my darling friend Suzanne Dean…lets’s give Suzanne some love…You are in my thoughts my friend!). The Challenge theme is SHEER/TRANSLUCENT…you can win a Gilli T-shirt and a few copics!!! The bright papers on this project are from stash. I embossed with Cuttlebug embossing folders (hey have you heard that the new cuttlebug is already on pre-order at stampingscrapping.com?). The groovy patterned paper is from DCWV. For the base where Maggie is jumping right out I used nestabilities large ovals and decorated using stamps from Stampingscrapping design stamps (they are made to fit in on Nestabilities, check them out!) and inks from SU. I added a little rhinestone at the center of each flower of the stamped image. The little frill on the sides are from my silhouette library. So join us from a load of fun at MSL and Copic Challenge Group….you can win big..and who doesn’t like a freebee!!! Stay tuned I have some REAL EXCITING NEWS to come…I will be posting a little later…HUGE news!!! So stick around! Hurry you have only 3 h left...sale ends at 12 am EST...I love a sale and I could not share that one with you...since not only Gilli is in the deal but much more!!! HURRYYYYYY. Here comes the bride…well the Gilli Spooky Bride. LOL. See how creepy she looks lol! AHHAHAHAHA (thriller laughter here). How do you like Gilli Romantic transformation?lol. Bildmalarna stamp :: Fly away! Hello fellow paper crafters and all other ones too! Holly molly it has been a little steamy around here…it takes a lot to make me sweat but today..whoa. Temps over 100F can do that lol. Well you know me by now, and know that I enjoy all these crazy changes! I am having fun…because before you know it someone will turn the fall weather on..lol. My new card is all about summer celebration..sand, bare foot, blue skies and beautiful kites! Talking about that have you ever done that? Fly a kite? Ohhh it is marvelous! I can say I tried lol…gosh the boys who I grew up with would do some crazy stuff with kites…even entangle lines to catch each others kite. It was fun. So what are you waiting for? Go something fun for the first time! Fly away! Magnolia Stamp :: Bright pieces! Hello my friends! One more Maggie card for us! This is my very first paper piecing card! WOW can you believe it? I told you I was new to papercrafting (when comparing to many of you I am a baby! So many things to try and make! I love cutting tiny pieces of paper..I am a nut case. This project was fabulous for fueling my meshuganeh! Yes. The tiny dress looks so pretty in this dot pattern. I think it worked quite well..dontacha think? Do you fell me? Yeap I think this is going to be the first of many of this tech! Join me at MSL challenge! See yall there! For my card features magnolia stamp, copic markers, air brush system, white pen, cardstock patterned, nenah paper, ribbon, glitter, memento ink, distress inks, paper flowers, die cut, embossing folder designs and glue dots. Bildmalarna stamp :: My orange therapy! Hello Everybody! We are starting a new challenge at SSCC! Challenge #2 the is water! Come and join us! The prizes are always super good! I think one of the colors that speaks summer is orange.Remember a while ago I said I need to conquer some of my fear of certain colors? Yeah! I did it again! Orange is one of my fear factor colors! HAHAH. Seriously I love oranges, clementines, etc. I admire touches or oranges in summer like patterns, but again I was always keeping my orange markers in the back of my pile….No more! Here is my bildie to prove it! Isn’t she lovely!? Hurray! So, how about you…have you been conquering and experimenting? My card features bildmalarna stamp from spring bildmalarna stamp club! Have you order the Fall club yet? There is still time! 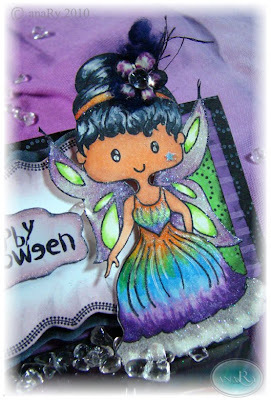 Copics, ribbon, cardstock, cuttlebug embossing folder and glue dots were used to make this card. I will add the copic list later today! See you all then! That is cake time! Hello! Hummm my very first post at StampingScrapping Challenge Central is all about cake! What a better way to celebrate ha? Humm yellow cake, chocolate cake, devil’s food cake, fruit cake…ooops that might be an adjective not a cake type lol! Simple. That is what I kept in mind here. Believe it or not I caught myself without any cards for an emergency bday.. wedding, a retirement, anniversary…..AHA! You got my idea! The bildmalarna stamp in my card is super duper versatile! I can see all kind of themes cards made with this one little stamp! So if you want to join the party link your card over SSCC! Don't forget the marvelous prize! A just rite set plus the idea book! That is what I call the whole package!!! Bildmalarna stamp, cardstock, neenah paper, die cut, glitter, Smooch ink, ZING embossing powder, ribbon, and copic markers! I am sending you happy thoughts! That is what i intend to do with my new Bildmalarna card! I am terrible in making phone calls, keeping in touch…soo bad. But I never forget my dear friends and they are all close to my heart. So this is a virtual hello!!! Maybe I should make a new years resolution lol…send off more cards, notes, smoke signals…e-mail..txt message! lol. Are you like that too? Well I am hosting the new challenge at Bildmalarna blog and the theme is “Pick your 3 favorite colors”. This is hard for me because I do have quite a few…but I chose white, aqua/green and pink. I always think of this color combination of being super feminine without being super sweet. Did I tell you how much I like my zutter distress it all…I LOVE THIS…you just zoooom and bam! You got your paper distressed! If you like this kind of look…get it. I also used nestabilities, embossing folders, ribbons and die cut embellishment. Copic and white maker. Nennah and patterned paper. To make things POP I used glue dots. Rember that if you need anything related to paper craft that you don’t see in store, e-mail Cindy…she makes magic..trust me. She will make it happen…anything you need!. Attention grab your markers & HAVE FUN!!!! While we are at it…run over stamping scrapping challenge central..NEW MEGA CHALLENGE blog…almost anything goes! The first prize is ssssweet….a just rite set and idea book!!! AMAZING! So it is a holiday weekend and tons of places to see and visit! Even of you are not schedule for a long trip how about visiting that close by museum, that little farm 20 minutes down the road…this is the time to do something you have been delaying for a while! Be free go have some fun! My card features Magnolia stamp and she is expecting a nice post card from you! : ). For this project I used cardstock, pattern paper, various stamps from my collection, copic markers, white pen, embellishments (brads and mini jewels), glue dots, various shades of memento and distress inks. How about join us for this imaginary fun trip! Come over magnolia stamp lovers and post in your card! Let your imagination run wild!! Magnolia stamp :: A yankee doodle! Hello! Are you getting ready to celebrate? Yessss! Bring on the hot dog (okay I will eat beans too!). One of these days I will venture to see a fire works..once more. The first one was quite, let’s say..well let’s not. LOL. I got stuck in a huge traffic jam in Philadelphia! Lol Well at least I was under the same sky that some of the greatest minds in this planet once had. Just to be in the same space where an amazing document was crafted, creating a whole new concept to a brand new country! WOW. That is fabulous! After thinking about all the history and the people that once cruised the same city…I wasn’t sad anymore about the traffic jam…Mr. Ford was up there probably proud looking down on upgraded versions of his visions. An American vision…just one of the greatest contribution to the world..assembly lines. See what I mean about sharing the goods?! This country was and is full of visionaries. Where do you think jeans was created?…like cola? Yeap..there you go again…and I would not be here talking you if was not for the great people that made possible to shrink ENIAC…into a PC! Sorry MAC people..I am a PC…lol..
Yankee Doodle dandy is also considered the state song of Connecticut! My card was made using cardstock (solids and DCWV), magnolia stamp, copic markers, cutllebug embossing folder, nestabilities, white pen, glue dots, memento ink and distress ink. Got questions…just ask on the side bar! Join us for a red, white and blue challenge at Magnolia Stamp Lovers! The DT came up with the cutest inspiration for ya!